As I was reading in Genesis 22, about Abraham taking the journey to sacrifice his only son in obedience to God, a few things began to speak to me through the passage. They started the journey with companions. Whatever the reason for these two young men, they were with them for a while, and then Abraham and Isaac had to go further, leaving them behind. Sometimes in the midst of our journey of life, possibly through a trial… we have friends (companions) along the way. They might be there for a season. They may help us through a difficult passage. They may even be encouragers. There comes a time… we need to move on to another place without them. They may still be praying for us, or encouraging us, but we have got to find a place of our own with God. Our whole life cannot be lived through others. There will be alone times. Lonely times. 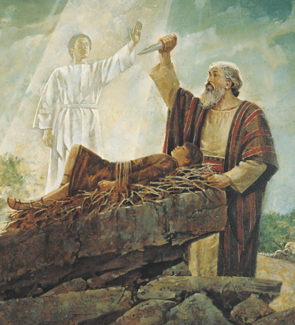 Abraham went forward with his promise (Isaac) and His God! Sometimes, it is exactly what we need in order to see the provision of God in our lives. This is where I want to be in the Lord. Willing enough to obey, trusting enough to walk in faith… and sensitive enough to hear. Abraham was obeying what God had told him. Often we know God has given us a word, and we move forward in that… so forcefully that we miss when he redirects us. Had Abraham not been sensitive enough to hear, he would have plunged ahead killing his promise… and let the world know God had told him to do it. But, God changed directions in the middle of Abraham’s trial… and only by being in tune with the voice of God did Abraham see the provision of God come through and his promise live! And Abraham called the name of the place Jehovah Jireh! Can you imagine his feelings as he saw the ram caught in the thicket? Can you imagine the joy, wonder and thankfulness in his heart? So many times, we only focus on the financial side of God being our provider… but it is so much more than that. He is Jehovah Jireh. Provides whatever is needed! At the moment it is needed! Right on time! I pray that I can get to the place in God where… who is with me doesn’t matter, I have my promise and my God. I pray that I can get to the place in God where… My obedience is not dependent upon my circumstances. God is in complete control, I just need to obey and trust completely. I pray that I can get to the place in God where… I am sensitive to his voice so that when he changes directions or wants to stop me in my tracks, that I hear him! I love this! I want this fully too! I want to have complete faith in Jesus, and rest in his arms through all my trials, and not be worried about my own desires to make me feel better in the moment but to sacrifice everything for Jesus….